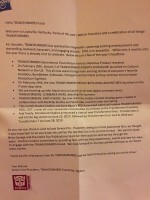 As BotCon kicks into gear this Thursday evening, it is with mixed emotions that this does appear to be the “last BotCon in its current format.” A social media post has surfaced revealing a Hasbro newsletter giving to fans at BotCon confirming that the Fun Publications run BotCon will be no more after this year’s 2016 event. 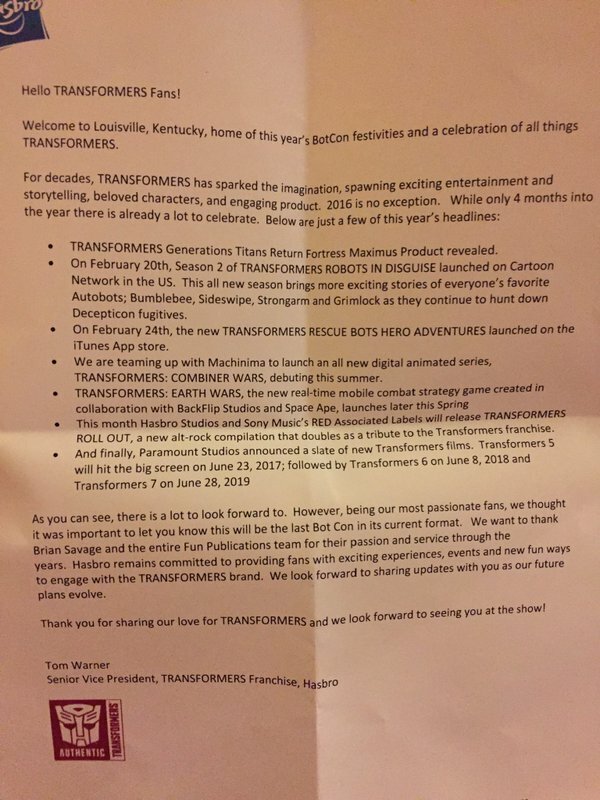 Hasbro goes on to say in the letter that “Hasbro remains committed to providing fans with exciting experiences” around the Transformers brand, but does not specify if that means new conventions are to be held or if the “BotCon” name itself will make a comeback under new leadership. More news and updates were promised at a later time from Hasbro. For those attending BotCon 2016, enjoy your time at the show as it does appear to be coming to a close. We’ll update all fans with any news as it becomes available. Going to Botcon at least once was on my bucket list. I am sad that I never had the opportunity. ^ Agreed. For me, the best part about BotCon was that it was all about Transformers. It was the best feeling, being completely immersed in my favorite fictional universe, surrounded by people who were all there for that one franchise. I'll miss that alot. If Hasbro does bring the convention in-house as many of us suspect, there's a really decent chance it'll be in Pasadena every year from now on. We've always heard that Hasbro favored a stationary location for Botcon but FunPub preferred to continue the tradition of moving it around every year. I have been suspecting that this would happen for awhile as well. I think it is likely that we will get a company wide "Hasbro-con" similar to disney's D23 show or Blizzard's Blizzcon. If so it would likely be in Southern California on a regular basis because of stuff we hav heard over the years from Hasbro where they have wanted the show to stay in one place and in Southern California so that it is easier to get voice talent, movie cars, etc to the show. I would like for there to be a show here but I have a feeling that any company wide show would become very large, similar to a mini SDCC. We would get some cool stuff but there would not be as much of a family feel. Part of the charm of BOTCON is the smaller feel, and getting to hang out with other fans who love the brand. I suspect that we might lose that element in a larger company wide show. I really regret not being able to make it to 2011 and 2012. Interested to see what goes down in the future! There is a certain irony that this being FunPubs last show their most popular exclusive is an unmade one from the OTFCC days. And also that it's the same mold they used in their first Botcon in 2005. Full circle! If I were running Hasbro I'd contract with ReedPOP and run HasbroCon with them pulling all the IP's together under one roof for a weekend and aiming at an attendance in the 30,000 range like Star Wars Celebration. A big show with a lot of programming and wider appeal making it a more mainstream vacation destination the whole family is excited to attend. This would also get their lesser known IP's exposure and some exclusives. They still do high end exclusives but for all of their IP's, similar to their San Diego output but more of everything. Get Hollywood to show up and make big presentations on their upcoming Hasbro movies like how the Avengers always show up at D23. Get all the Autobot movie cars there and stage some races. Have every licensee there showing off their upcoming items, not just a few hats in a display case. I think this exactly what they want to do. Transfoermers is big enough that it might get its own, as well. On a side note I have to ask; are you the one selling the soap duckies at Botcon? Cuz I stopped by that booth and bought like two things from there and I'd love to hi again and formally meet you in person. Yes, I have the soap ducks. Come on by! I cannot say too much of the Con experience since I was never able to attend a Botcon but I would have been leery about signing up for the Club and getting the Con packages because of the documented issues with Credit Card security and the system issues that would crop up when trying to register. Not trying to flame the issue but going off of documented issues and stories. Still bittersweet though if this does end up being the last "BotCon" though regardless of who was running it. I hope that if Hasbro does try to continue the Convention style show in some form or fashion they continue to move it around from place to place or at the very least have a main big show at a fixed location and maybe 1 to 2 smaller traveling Cons a year. I don't think I would be opposed to exclusives or the higher prices for them but maybe not make it required to join a club to get access to buy them. Perhaps sell them at the Convention and if they do happen to have some stock left, sell them at HTS like they do the SDCC exclusives. Wishful thinking I know, but I can hope right? Selfishly I'd be happy if it were in Pasadena just because that's 20 minutes away. But as a member of the fandom I would feel it's unfair to everyone else if it was stationary. I remember being really happy in 2009 that it was so close by and going to my first Botcon. I would love for more people to have the joy that I did in that way. …but I admittedly just assumed they'd be back in Pasadena in a few years and maybe then I could be around more and have the chance to meet certain people from the boards or Twitter. My ambivalence about all this hinges on what Hasbro does next. If they keep things going on in some fashion (as someone else mentioned, building on the good things Fun Pub did, while not repeating the same mistakes) that will make me happy. Honestly, if Hasbro wants Transformers to grow and be as big as other major properties/fandoms, holding an official convention is a good thing, so hopefully we get some good news on that front. The only Botcon I ever went to was '14 in Pasadena. That was largely because it was local (I live in the Inland Empire, so Pasadena's a straight shot drive in) so going was convenient, and I liked what was in the box set that year. I only showed up on Friday for toy pickup and Sunday, so I didn't even get to "experience" much at all. Traveling for a convention is expensive for me (same reason I haven't traveled out of state for a TFCon, let alone Botcon) and I already do SDCC every year, so being a regular was always going to be hard for me…but I admittedly just assumed they'd be back in Pasadena in a few years and maybe then I could be around more and have the chance to meet certain people from the boards or Twitter. Selfishly, yes I do hope the exclusives continue on as well, and hopefully hit that sweet spot some of the best from Fun Pub did (nice looking, something that probably wouldn't exist otherwise). Be it box sets, random one-offs, an extension of the subscription series, whatever, I would enjoy it if they continue in a more creative fashion than what we see in Platinum gift sets & SDCC exclusives. I don't exactly see third parties cranking out their own Action Masters or other random bits, and if the entire market switches to being more MP-oriented they probably wouldn't be much of an option anyways. So yeah, we'll see what the future holds, I guess. Keep it civil. There will be ZERO tolerance for anyone coming into this thread to troll and spout off for the sake of inciting arguments. Well it's about they officially confirmed it. Personally I'd hope we continue to see a BotCon that is not longer associated with Hasbro. Make it a fan convention like TFcon, Auto Assembly, etc. The only reason FunPub was ever considered passable is due to Hasbro giving them the license to make them official. One of their conventions without Hasbro would be a true honest to god trainwreck. Every one seems to be missing that part. It seems to imply that Hasbro already plans on more Botcons to be a thing. Just not run by Fun Pub. Only went in 2005 (crap, 11 years ago!) and it was ok. I thoroughly enjoyed seeing the new product presentation and new toys well in advance. The dealer room was pretty amazing as well. That said, I felt very out of place and haven't gone back since for various reasons. Mainly, the info will reach me shortly, I can obtain exclusive easily, and my interest is primarily the toys (Nearly MP exclusive at this point) rather than fiction, so I'm pretty limited in what I get out of an official convention. My wallet, for one, welcomes its new TFCON overlord. It's sorta a shame. I got to go to Botcon for the first time last year, and I had a great time. This happened to the GI Joe Club as well….I'm curious as to what Hasbro is gonna do…also bourbon sales are gonna be huge since it's the last convention and its in Louisville. Word of advice, go to a bar and order one nice bourbon and then just drink the Old Grand Daddy the rest of the time. Maybe Hasbro will go to who ever puts on TFcon from now on. But the third party ban will stay in place. My understanding (never been) of what makes TFCon fun is, in part, being able to find anything for sale. I'm more interested/concerned in whether or not whatever comes next will still have exclusive figures of sub-retail interest characters. I don't want every figure FunPub produces, but I really appreciate some of them. It'll be a shame if a channel like that disappears completely for getting interesting figures.